Did you ever feel like your boss was constantly looking over your shoulder? Well, thanks to someone’s generosity, we have one of those baby backpack dealios so that Ella can follow me around all day. This weekend, it was laying a floor for her fashion icon Sophie, and her friend Grant, and then for the past couple of days it has been endless cutting and stacking of brush and bamboo at the homestead in the blazing sun. She’s a stickler for zero-defect work and she is quite rigid about lunchtime and nap time (when she still expects me to work). I’m so tired. And I think she’s planning some cleaning and more yardwork for tomorrow. Oy. 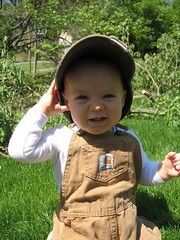 Baby Carharts! Ella is the coolest. Also, Grant and Sophie are extremely grateful for her help and for lending us her daddy to help with their floor. It is making life here much easier.